Date of Destruction: 41 BCE: Marc Antony allegedly gives library collection of 200,000 volumes to Cleopatra to compensate for damage to the Alexandria Library by Julius Caesar. Another version says that Marc Antony gave the 200,000 volumes to Cleopatra as a wedding present. Either way the Library facility may have continued beyond that time. The Greek city came peacefully under Roman rule in 133 BCE and after that its fate was tied to that of the Roman Empire. 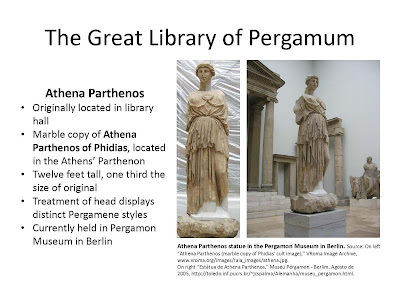 Size:"The Ptolemies of Alexandria and the Attalids of Pergamon are known to have been avid collectors of books and the founders of two of the greatest libraries during the Hellenistic age. These libraries were notable for their size as well as for the intellectual climate they supported. The Ptolemies are said to have collected over 400,000 volumes (or 700,000) books and the Attalids 200,000 books." source: Lora Lee Johnson, The Hellenistic and Roman Library: Studies Pertaining to Their Architectural Form, p 1. "...In 1884, Conze published a description of the building behind the north stoa of the Sanctuary of Athena at Pergamon. He identified them as the Hellenistic library built by the Attalid kings." 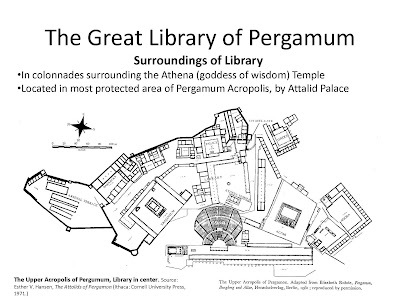 source: Lora Lee Johnson, The Hellenistic and Roman Library: Studies Pertaining to Their Architectural Form, p 3. 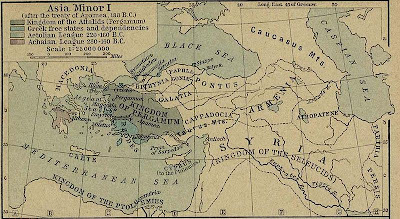 Click images to enlarge The Kingdom of Pergamon (colored olive), shown at its greatest extent in 188 BC. 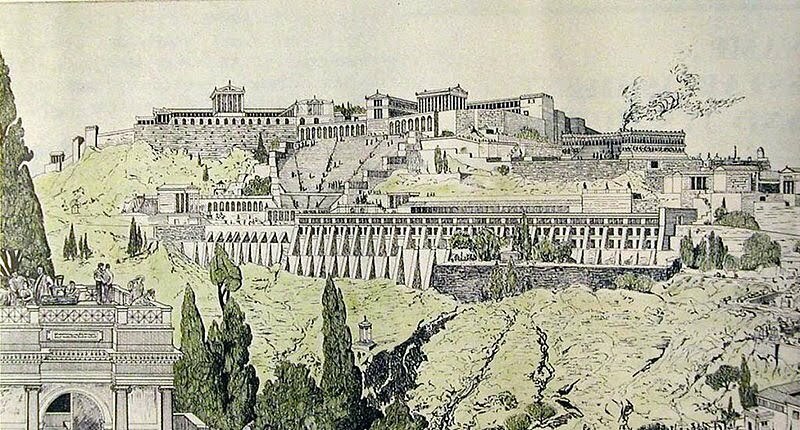 Artist sketch of the upper acropolis on a high hill in Pergamum overlooking the ancient city below. "In the era following the death of Alexander the Great (323 BC), Lysimachus, one of Alexander’s generals, chose Pergamum as the depository for his vast wealth, placing here 9,000 talents of gold [today one talent is about $14,000] under the guardianship of his lieutenant, Philetaerus. Upon Lysimachus’s death, Philetaerus used this fortune and founded the independent dynasty of the Attalid Kings. Pergamum later became the capital of a flourishing Hellenistic kingdom and one of the principal centers of Hellenistic civilization. Under Kings Attalus I and Eumenes II, Pergamum reached the height of its independent powers. At the same time, however, it began to look to Rome for alliance against the warring Hellenistic rulers. After signalizing himself as a friend of Rome, Attalus I was awarded the Seleucid dominions, making Pergamum a powerful kingdom, comprising of Mysia, Lydia, Caria, Pamphylia and Phrygia. In addition to extending the kingdom, Attalus I adorned his capital with architectural splendors. Eumenes II also brought the city to the climax of its cultural prominence. During the reigns of these two prominent kings, the city so flourished that it could only be compared to Antioch and Alexandria. "King Attalus III bequeathed (133 BC) his domains to the Romans, under whom the city retained its position as the preeminent artistic and intellectual center of Anatolia but declined in political and economic importance. "The city went through the Arab, Byzantine and finally the Turkish period in the 14C. 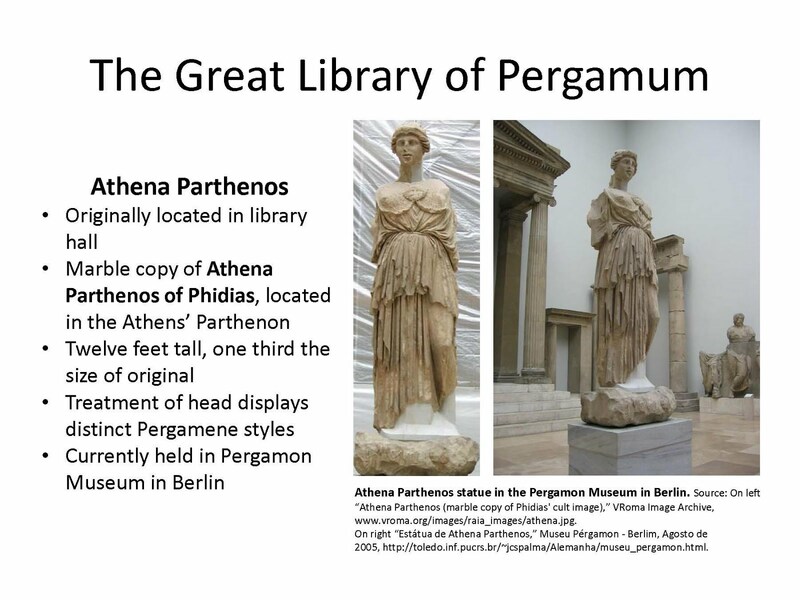 "Pergamum attained a high culture in the Hellenistic era, boasting an outstanding library that rivaled in importance that of Alexandria, a famous school of sculpture and excellent public buildings and monuments of which the Zeus Altar is the best example. "In the Roman period, Pergamum played an important role in the early history of Christianity. It was also numbered among the Seven Churches of Revelation." 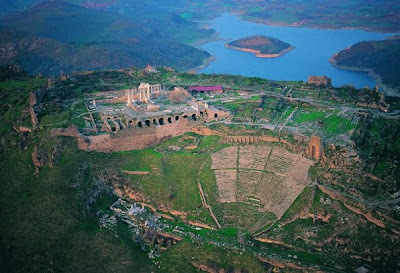 ---In contrast to the ancient city of Alexandria, an impression is that the ancient city of Pergamum was a city built for the social and cultural enjoyment of its citizens. Whereas Alexandria had cultural diversity that often lead to violent exchanges between its city residents (Christians, fundamentalist Christians, Jews, and Pagans), Pergamum did not. That is impression taken from the way the city is layed out with its library integrated into the city complex. 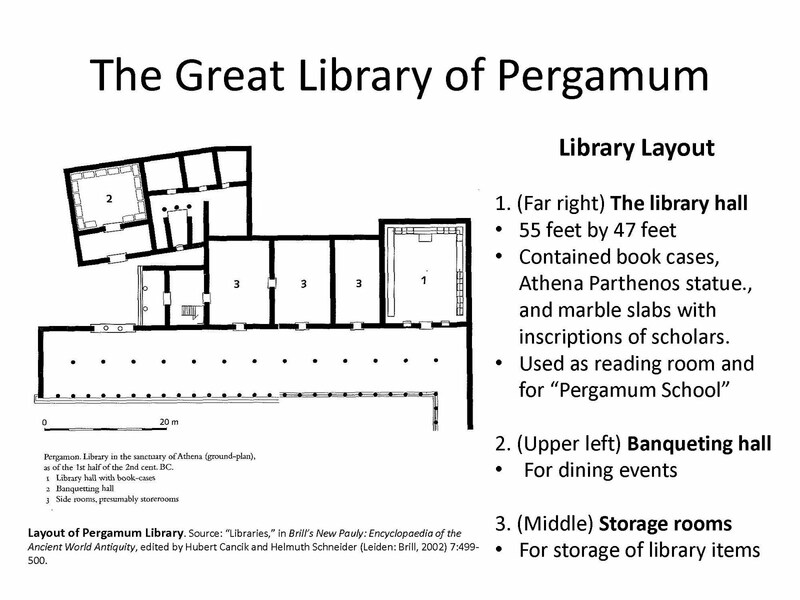 Unlike, Alexandria, Pergamum's main library was integrated into the city life and the life of its residents. Life in Pergamum was probably less stressful, more enjoyable and less dangerous than the volatile Alexandria. 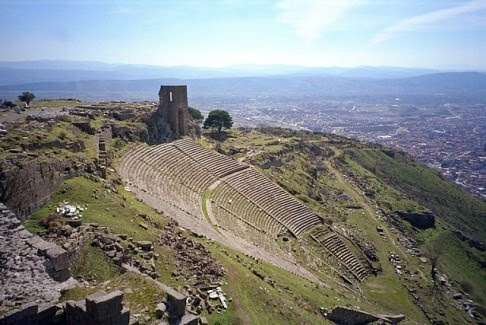 Ironically, Pergamum and its predominately non-Christian culture was considered the city of Satan by early Christians and is one of the seven cities mentioned in Revelations. see also Pergamum for a tour of the ancient city ruins. 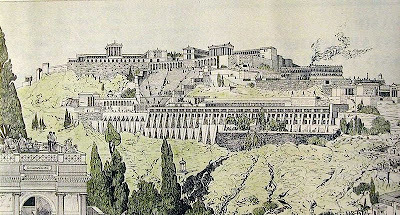 The ancient city of Pergamum is composed of three main parts: the Acropolis, whose main function was social and cultural as much as it was religious; the Red Basilica which was built as a Serapis Temple converted into a Byzantine church; and the Asklepion, one of the earliest medical centers in antiquity. ""Pergamum’s dominant feature is its acropolis, the hill on which the highest portion of the city was built. The acropolis rises above the plain below, commanding a spectacular view of the surrounding region. In the centuries before the Christian Era, the kings of Pergamum built palaces and temples on top of the acropolis. "As the Romans expanded their power in the second century B.C., prospects of remaining independent faded. The last king of Pergamum gave the city and its realm to the Romans in 133 B.C. Afterward, the Romans made Pergamum an important administrative center for the province of Asia." "The Pergamum acropolis is a masterpiece of city planning, built over a period of more than 150 years (283-133 BCE, with a few later additions)." "The function of the acropolis in Pergamum was never the same as the function of the acropolis in Athens. In Athens everything was focused on religion, whereas in Pergamum it was on social and cultural activities, or in other words, daily life. As a result of this contrast, major buildings in Pergamum were reserved for public use in daily life. Even in the temples, religion was of secondary importance. Buildings had large areas for the public where they could meet, walk or join in social affairs. 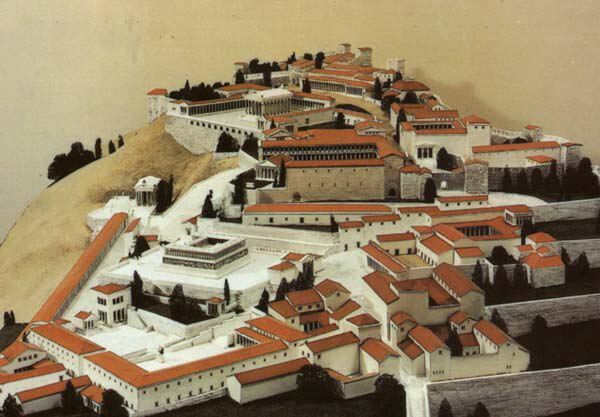 Pergamum was the first city to react against functional urbanism of Hippodamus preferring ornamental urbanism. Pergamenes agreed that functionalism was necessary, but that aesthetics were to be given even more consideration. The buildings of the Acropolis were designed to be seen from below and to impress those viewing the city from the valley. "Except for the Trajan Temple all the buildings were built in the Hellenistic period during which constructions were made of andesite and very rarely in marble. 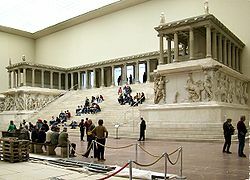 The Great Altar of Pergamon. 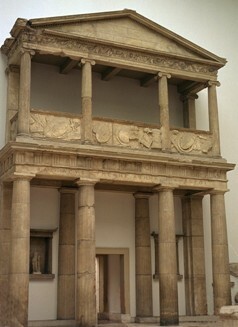 The Great Altar of Pergamonis in the Pergamon Museum, Berlin. The base of this altar remains on the upper part of the Acropolis. It was perhaps to this altar, believed dedicated to Zeus, that John of Patmos referred to as "Satan's Throne" in his Book of Revelation (Revelation 2:12-13). With some imagination when you look at the structure, you might imagine it to be a throne. "The altar to the god Zeus was one of the most impressive structures on Pergamum’s acropolis. The altar’s stairs, columns, and sculptured sides once stood forty feet high. Today only the steps around the altar’s base can be seen. The sides of the altar were ornamented with marble panels that depicted a mythical battle between the Greek gods and the rebellious giants, who were the sons of mother earth. The altar was built several centuries before Christ to commemorate the victories of the armies of Pergamum. The Hellenistic Theater with a seating capacity of 10,000. This had the steepest seating of any known theater in the ancient world. Pergamum’s theater was etched into the steep slope of the acropolis, overlooking the valley. It had 80 rows of seats that could accommodate 10,000 people for performances of plays and musical competitions. Wooden structures were assembled on the stage during theatrical performances. The Sanctuary of Athena "The sanctuary of Athena was located on the top of the acropolis. It consisted of a temple and a sacred area. The monumental gate to the sanctuary is shown at the right. The inscription on it reads, "King Eumenes to Athena Bringer of Victory." The frieze in the central part of the gateway shows shields and weapons taken as booty from the Pergamene victory over the Galatians, who were a neighboring people to the east. The statue of Athena shown at the left stood in the north hall of the sanctuary. She is depicted in a manner that connotes strength and wisdom. At the foot of the acropolis is Pergamon's other notable structure is the Serapis Temple (Serapeum). The temple dedicated to the ancient Egyptian god of the underworld was erected in the lower city of Pergamum. The Serapis cult was founded by Ptolemy I and was centered in Alexandria. Many Roman emperors tried to reconcile the various beliefs existing in the provinces of the empire by promoting the cult of deities which in a way were a summary of these faiths. Serapis was a god whose cult was first promoted by the Ptolemaic dynasty to integrate the Egyptian religion with that of their Hellenic rulers. Serapis had features of both Zeus and Osiris. 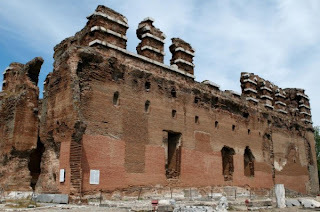 The Serapis Temple was later transformed into a Christian Church known as the Red Basilica complex..., about one kilometer south of the Acropolis. It consists of a main building and two round towers. 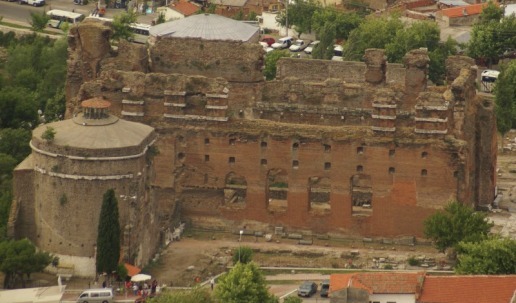 In the first century AD, the Christian Church at Pergamon inside the main building of the Red Basilica was one of the Seven Churches to which the Book of Revelation was addressed (Revelation 2:12). Photo of "one of Pergamon’s notable structures is the Serapis Temple (Serapeum) which was later transformed into the Red Basilica complex (or Kizil Avlu in Turkish), about one kilometer south of the Acropolis. It consists of a main building and two round towers. In the first century AD, the Christian Church at Pergamon inside the main building of the Red Basilica was one of the Seven Churches to which the Book of Revelation was addressed (Revelation 2:12). 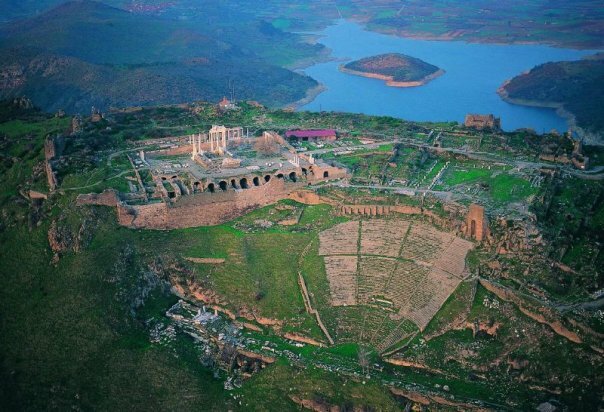 The forecourt is still supported by the 193 m wide Pergamon Bridge, the largest bridge substruction of antiquity. "It is believed that this was a “Temple of the Egyptian Gods”. And the architects were Egyptians. A temple in western Anatolia devoted to Egyptian gods is not something to be expected. This building had one of the biggest domes of the time, but unfortunately most of the ceiling has been destroyed probably by earthquakes. "By wandering in the archaeological area one can find evidence that in the following centuries the site housed a Byzantine church, a Jewish cemetery and several Ottoman buildings. "Asclepieum was a sanctuary and a healing center built in the name of the god of healing, Asclepius. It was similar to the one in Epidauros in Greece. Although this place was set up in the 4C BC, it had its peak in the Roman period. "Asclepius, son of Apollo, the god of healing, was a famous physician. His mother, Coronis, a princess of Thessaly, died when he was an infant. Apollo entrusted the child’s education to Chiron, a centaur, who taught Asclepius the healing arts. Asclepius, when grown, became so skilled in surgery and the use of medicinal plants that he could even restore the dead back to life. Hades, ruler of the dead, became alarmed at this and complained to Zeus, who killed Asclepius with a thunderbolt. The healing center, Asclepieum, had been something very similar to a modern natural healing clinic. Patients were given exercises, drugs, herbal remedies, or could take the honey cure, drink the waters of the spring or be treated by suggestion. They could walk among the trees and be calmed by the scent of pine. Over the gate had been inscribed the words: "In the name of the Gods, Death is forbidden to enter". Snakes were sacred to Asclepius because of their power to renew themselves. That is why there was a relief of snakes at the entrance to the sacred area of the medical center symbolizing health. Among the famous physicians of the Asclepieum was Galen. "Galen was the most outstanding physician of antiquity after Hippocrates. His anatomical studies on animals and observations of how the human body functions dominated medical theory and practice for 1400 years. Galen was born in Pergamum. A shrine to the healing god Asclepius was located in Pergamum and there young Galen observed how the medical techniques of the time were used to treat the ill or wounded. He received his formal medical training in nearby Smyrna and then traveled widely, gaining more medical knowledge. "Galen dissected many animals, particularly goats, pigs and monkeys, to demonstrate how different muscles are controlled at different levels of the spinal cord. He also showed that the brain controls the voice. Galen showed that arteries carry blood, disproving the 400-year-old belief that arteries carry air. Galen was also highly praised in his time as a philosopher. He closely followed the view of the philosopher Aristotle that nothing in nature is superfluous. Galen’s principal contribution to philosophic thought was the concept that God’s purposes can be understood by examining nature. Galen’s observations in anatomy remained his most enduring contribution. His medical writings were translated by 9C Arab scholars. 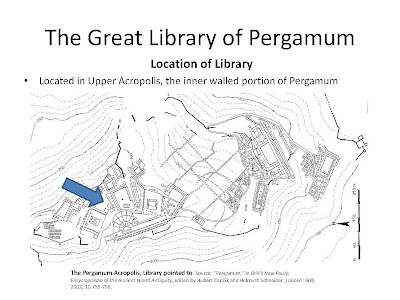 "This area on the west side of ancient Pergamum was dedicated to Aesklepius (Aesculapius), the god of healing, one of dozens of such temples throughout the Hellenistic world, the most famous of which is at Epidaurus in Greece. Those seeking healing would walk 807 m. (2690 ft.) down the impressive colonnaded street ("The Sacred Way") and, after drinking a hallucinatory potion, would pass through the tunnel, in which they would hear encouraging whispers from the Aesklepian priests stationed at openings in the tunnel's ceiling. Upon entering what is now known as the Temple of Telephorus (the son of Aesklepius), they would bathe in a sacred pool and then lie down in an assigned place to sleep and dream. The sanctuary had many harmless snakes, whose ability to be "reborn" as they shed their skins came to symbolize the healing of the patients. 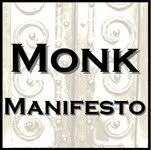 The god would contact such a subject by dreams, which a priest would interpret the next morning as instructions for therapy." "Given the fact that the city represented the epitome of Hellenistic culture, traditions and religion in both its pursuits and its very architecture, it is perhaps not surprising that early Christians viewed it as a bastion of all that was anathematic to Christian beliefs. In the Book of Revelation, John conveys a message from the risen Christ to seven Christian congregations in Asia Minor, all of which are located in modern Turkey. Pergamon’s congregation was one of these, and Christ’s message to the faithful praises them for adhering to their faith while living in the place “where Satan dwells.” Antipas, a Christian bishop of Pergamon, was believed to have been martyred here at the end of the first century A.D., around the time when many scholars believe the Book of Revelation was composed. The execution of their bishop certainly would not have endeared the city to its Christian inhabitants, and the Biblical reference to the city is reflective of the general tension between Christian and pagan communities at the end of the first century A.D"
"This message is from him who wields the sharp and double-bladed sword. (13) I am fully aware that you live in the city where Satan’s throne is, at the center of satanic worship; and yet you have remained loyal to me and refused to deny me, even when Antipas, my faithful witness, was martyred among you by Satan’s devotees. (14) "And yet I have a few things against you. You tolerate some among you who do as Balaam did when he taught Balak how to ruin the people of Israel by involving them in sexual sin and encouraging them to go to idol feasts. (15) Yes, you have some of these very same followers of Balaam among you! (16) "Change your mind and attitude, or else I will come to you suddenly and fight against them with the sword of my mouth. (17) "Let everyone who can hear, listen to what the Spirit is saying to the churches: Every one who is victorious shall eat of the hidden manna, the secret nourishment from heaven; and I will give to each a white stone and on the stone will be engraved a new name that no one else knows except the one receiving it. "The religious life of Pergamum has been the subject of much research by scholars and historians. Three specific threads appear to be visible. First, the association with the worship of snakes and the handling of reptiles in antiquity appears valid. Other early signs of the worship of Dionysus, the god of vegetation also appears to be well accepted. Later, worship of Asklepios (Roman Aesculapius) the god of healing emerged. The serpent became the emblem of Asklepios. A Pergamene coin shows the emperor Caracalla standing spear in hand before a great serpent twined around a bending sapling. Christians must thus have found the cult of the god of healing, and his serpent infested temple, peculiarly revolting (Blaiklock, Ibid.). The altar of Zeus built by Eumenes II to commemorate the victory of Attalus I over the Gallic invaders had striking pagan scenes on the frieze. The gods of Olympus were represented as giants with serpent like tails. Zeus was called saviour. "The second association was dominant in the Hellenistic kingdom. This included the worship of Zeus and the goddess Athene. Finally, the Imperial Cult flourished in the city, making it a neokoros or temple guardian for the Roman Imperial cult. The first temple in Asia was erected to Augustus in 29BCE. Other temples were later erected to honor Trajan and Caracalla. It was Emperor Domitian who made these temples a litmus test for civic loyalty. 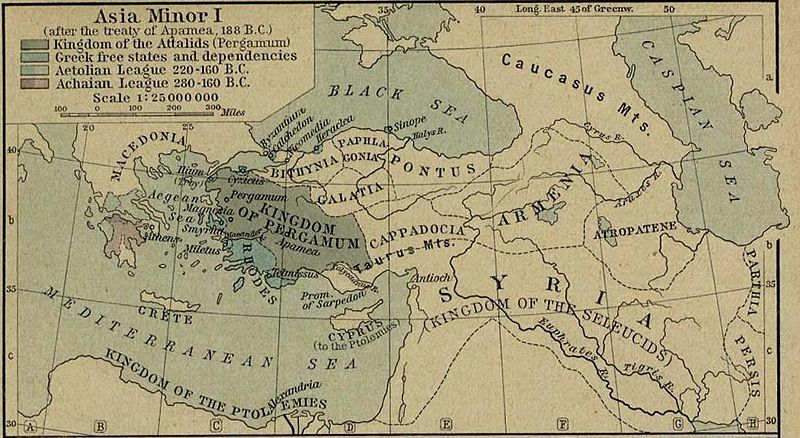 "Pergamon's strategic location along both land and sea trading routes contributed to its prosperity. 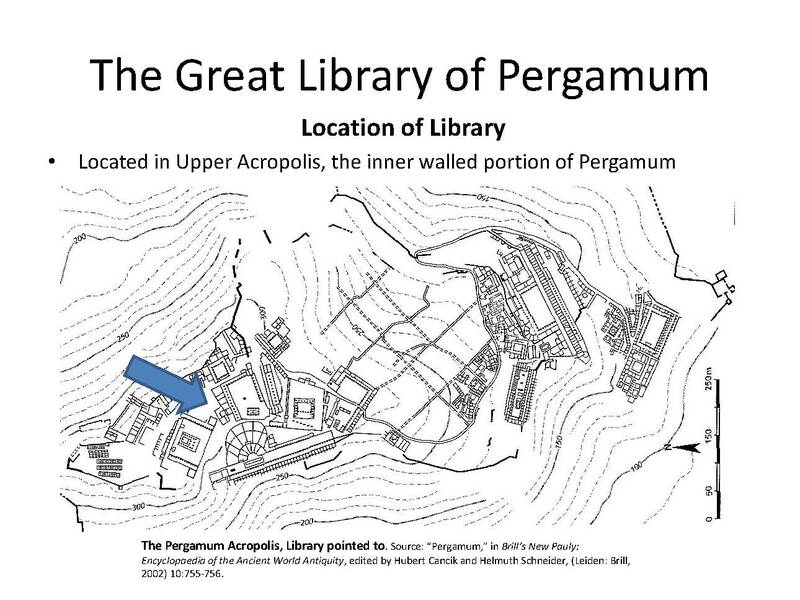 Pilgrims from all over the Mediterranean region would flock to the city to engage in commerce or to visit the famous Ascelpion, a center of medical treatments"
"Pergamum was home to a library said to house approximately 200,000 volumes, according to the writings of Plutarch. Built by Eumenes II and situated at the northern end of the Acropolis, it became one of the most important ancient libraries. 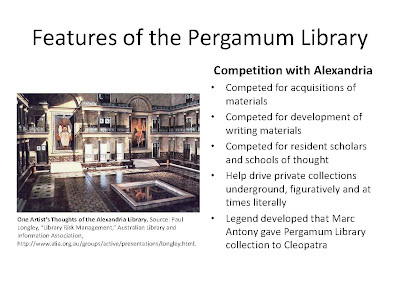 Legend has it that Mark Antony later gave Cleopatra all of the 200,000 volumes at Pergamum for the Library at Alexandria as a wedding present, emptying the shelves and ending the dominance of the Library at Pergamum. "No index or catalog of the holdings at Pergamum exists today, making it impossible to know the true size or scope of this collection. "Historical accounts claim that the library possessed a large main reading room, lined with many shelves. An empty space was left between the outer walls and the shelves to allow for air circulation. This was intended to prevent the library from becoming overly humid in the warm climate of Anatolia and can be seen as an early attempt at library preservation. Manuscripts were written on parchment [a leather writing material that was developed at Pergamum], rolled, and then stored on these shelves. "A statue of Athena, the goddess of wisdom, stood in the main reading room. "When the Ptolemies (Egypt) stopped exporting papyrus, partly because of competitors and partly because of shortages, the Pergamenes invented a new substance to use in codices, called pergaminus or pergamena (parchment) after the city. This was made of fine calfskin, a predecessor of vellum. Click images to enlarge Model of Pergamum Acropolis in the Pergamon Museum in Berlin..
source: “Lecture Notes Mediterranean Civilizations, ca. 2000 BC-AD 500,” The University of North Carolina at Pembroke, http://www.uncp.edu/home/rwb/lecture_med_civ.htm. 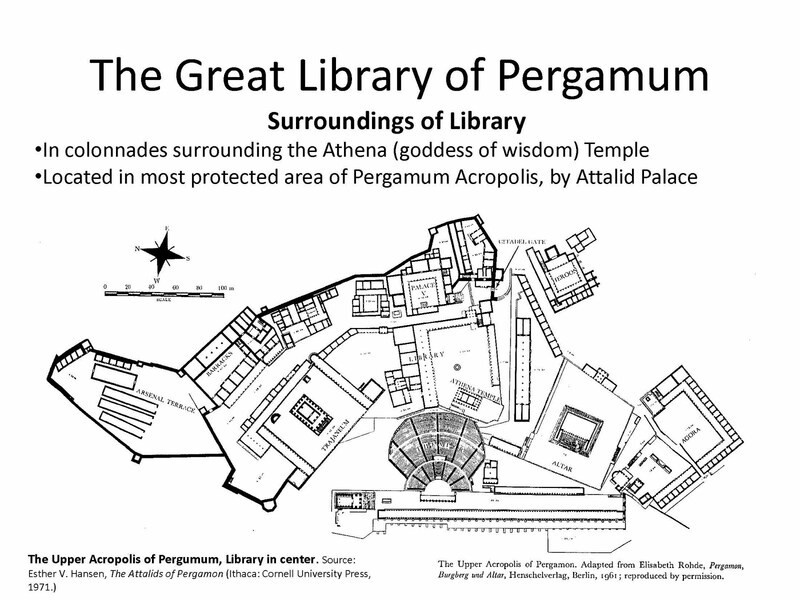 The Pergamum Acropolis, Library pointed to. Source: “Pergamum,” in Brill’s New Pauly: Encyclopaedia of the Ancient World Antiquity, edited by Hubert Cancik and Helmuth Schneider, (Leiden: Brill, 2002) 10:755-756. 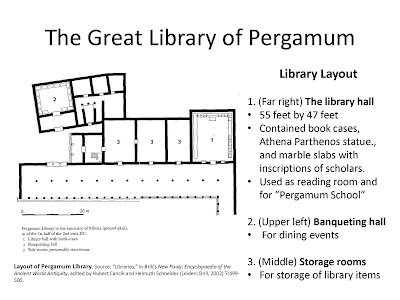 Layout of Pergamum Library. Source: “Libraries,” in Brill’s New Pauly: Encyclopaedia of the Ancient World Antiquity, edited by Hubert Cancik and Helmuth Schneider (Leiden: Brill, 2002) 7:499-500. Athena Parthenos statue in the Pergamon Museum in Berlin. Source: On left “Athena Parthenos (marble copy of Phidias' cult image),” VRoma Image Archive, www.vroma.org/images/raia_images/athena.jpg.On right “Estátua de Athena Parthenos,” Museu Pérgamon -Berlim, Agosto de 2005,http://toledo.inf.pucrs.br/~jcspalma/Alemanha/museu_pergamon.html. One Artist’s Thoughts of the Alexandria Library. 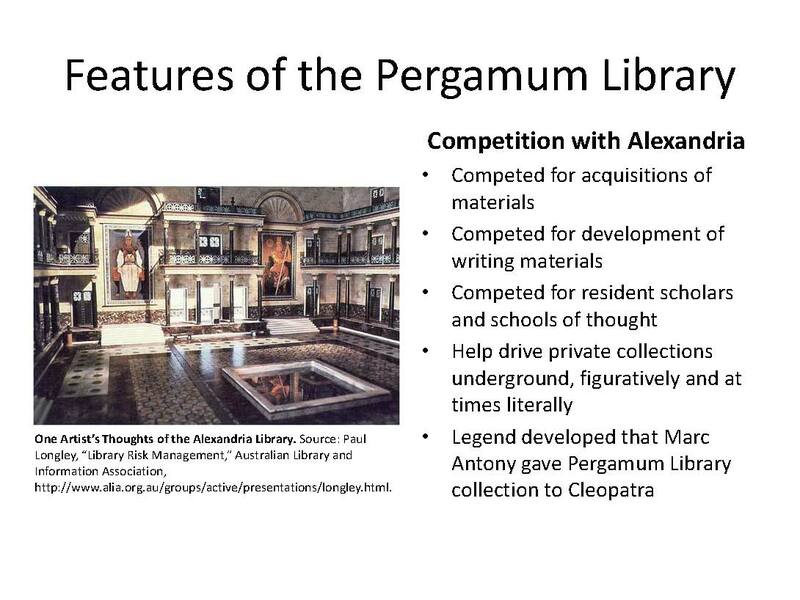 Source: Paul Longley, “Library Risk Management,” Australian Library and Information Association, http://www.alia.org.au/groups/active/presentations/longley.html.